We’d love your help. 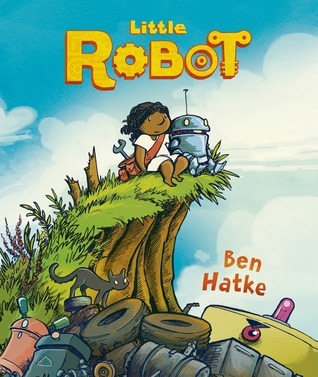 Let us know what’s wrong with this preview of Little Robot by Ben Hatke. Life outside the robot factory is confusing. But with danger in the way, will friendship be enough to save them? To ask other readers questions about Little Robot, please sign up. This is a GREAT book, why isn't there like a MILLION other books in the world??? THIS IS THE GREATEST BOOK EVER!!!! Another very impressive book by Ben Hatke. Not just a delightfully good graphic novel that will be a delight for kids, but this one has a *very* minimal verbal content, which is exceptionally hard to pull off. That said, the lack of a strong textual component means that this book is readable by even younger kids. So long as they've been exposed to some comics, I'd say most kids of 4-5 should be able to read this by themselves. And I wouldn't be surprised if a few precocious 3 year olds would enjoy Another very impressive book by Ben Hatke. I really think I'm physically incapable of giving Ben Hatke's books anything less than 5 stars. The reasons for this being that Hatke continues to create such memorable characters and beautiful artwork. After reading all of his works, I totally consider him an auto-buy-author for me. Not only are his books enjoyable for myself as an adult, but my kids absolutely love his works too. What makes Hatke's books stand out for me the most is that each of his main characters have been of different races. I really think I'm physically incapable of giving Ben Hatke's books anything less than 5 stars. The reasons for this being that Hatke continues to create such memorable characters and beautiful artwork. After reading all of his works, I totally consider him an auto-buy-author for me. Not only are his books enjoyable for myself as an adult, but my kids absolutely love his works too. What makes Hatke's books stand out for me the most is that each of his main characters have been of different races. Sometimes it can be difficult to find this in childrens' books, so you have no idea how good it feels when you hear your daughter say, "Hey! She looks just like me!" Tears, guys. Tears. Not only do his books feature diverse characters, but they feature strong female heroines who have super fun adventures like traveling through space, imaginary creatures, and the newest edition: a female mechanic! But on to the review! Little Robot is a charming story about friendship and accepting differences. Our heroine is a very capable kid who doesn't exactly fit in with other kids her age. She enjoys fixing objects and creating new and improved versions things. Meanwhile, there is a little robot who has escape an assembly line and somehow their paths cross. And, thus, two unlikely friends become the best of friends. Through the book, their friendship changes. 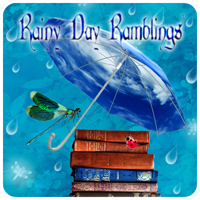 Our characters learn boundaries and how to deal with disagreements and acceptance. In fact, I really loved the friendship between the characters because it was an issue my own kids could relate to. They could easily keep up with the pace of the story and tell when a character was "being mean" or "not being very nice," according to my kids. The simple, yet candid storytelling was an instant hit for us and provided a good discussion on what it means to be a good friend. It kept him interested and we'd frequently stay on those pages and just admire the artwork. Likewise, the text was very simple and is perfect for early readers. My 7-year-old was able to read the entire book on her own. All in all, this is another fantastic book from Hatke. If you have little readers in your home or enjoy picture books yourself, I would definitely recommend this one! Review copy was provided by the publisher for an honest review. 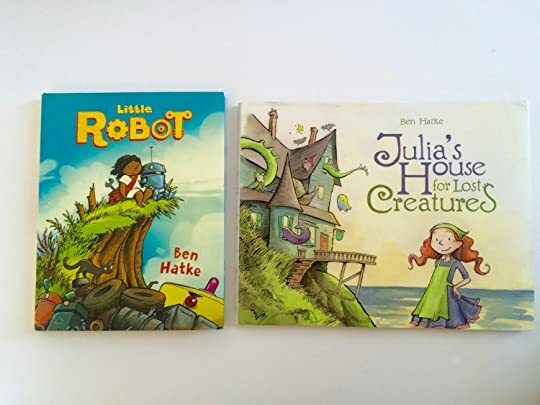 I am in awe of Ben Hatke. There is barely any dialog in this graphic novel, and yet, everything is perfectly clear. Everything makes sense. Nothing seems out of place or to be missing. Unfortunately this means that you can go through this book in less than ten minutes. This is especially unfortunate because the characters are so loveable and curious. A little girl engineer. A little lost robot. A most unique duo. On the bright side, the lack of abundant dialog and fast-pacing make this suitable I am in awe of Ben Hatke. There is barely any dialog in this graphic novel, and yet, everything is perfectly clear. Everything makes sense. Nothing seems out of place or to be missing. On the bright side, the lack of abundant dialog and fast-pacing make this suitable for very young readers, as mentioned by a reviewer. There’s nothing I love more than a book that works for both children and adults. This is the story of a little lonely girl who finds a little misplaced robot. Suddenly the little girl has a new companion. Meanwhile, a big, angry yellow robot is searching for the little one, to bring him back to the factory. I have no negative comments to make about LITTLE ROBOT. It was short indeed, but enjoyable regardless. And again, not short enough to prevent the reader from connecting with the characters. 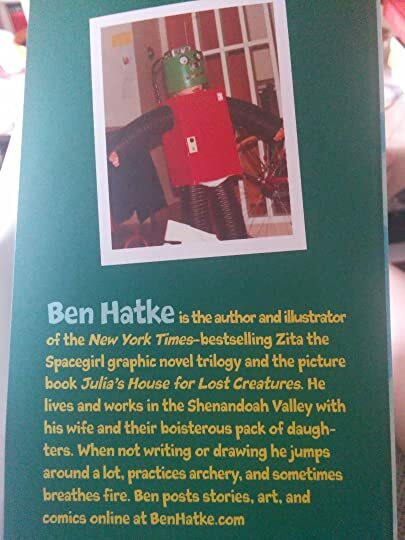 I think that Ben Hatke is just marvelous, and this is his best book yet! I love that Ben gives us a story with this book about a girl who is an engineer. Bookish, dreaming protagonists are great, but it's also awesome to have stories about girls who are like, 'okay, I'm here for SCIENCE!' I feel like there are too few of those in our fiction today. Also this whole book is just the adorablest! What a cute little book - full of important life lessons! The book has only panels, no text (except for the occasional noises the robots make or the girl's speech bubbles). This means that the reader (young and old) has to actually piece it together, which I find fantastic! The story is about a little girl who apparently has no friends and doesn't go to school. One day she finds a little robot and they spend time together. There's a lot more which I will not give away but in general, this book is What a cute little book - full of important life lessons! The story is emotional, funny and thrilling too (not too dark though, don't worry) and even shows a not-too-perfect MC. I'm so glad I found this little gem! It's not news to anyone who's hung around my blog/vlog for any length of time that I love the work of Ben Hatke. (Also not news to anyone who read that intro, so. . .) I've talked about this many, many times, and pushed his books on many, many people, both online and IRL. So of course, I'm always looking forward to whatever's coming up next, confident in the belief that whatever it is is sure to brighten my shelves. And Little Robot is no exception to that rule. 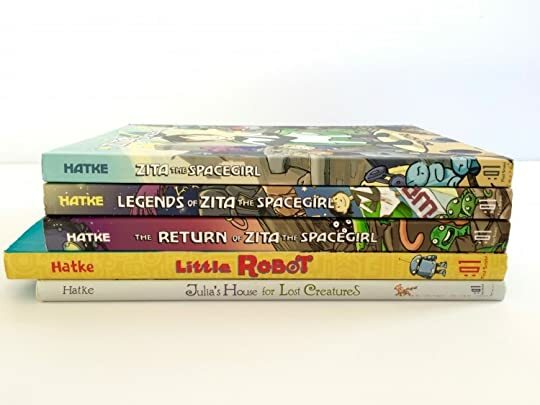 Little Robot follows in the tradition of plucky young female protagonists and their oddball companions, set by Julia's House for Lost Creatures and the Zita the Spacegirl series. 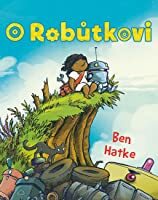 Unlike Hatke's previous books, Little Robot is nearly wordless (and of the words that make it to the page, most of them are in robot, so...), though its no less full of story as a result. If there's anything Hatke excels at, it's injecting as much personality as possible into every frame, every character, every inanimate object -- and yes, I mean that literally. More than once, this man has made me have feels about rocks, literal rocks with eyeballs, and monsters, and what may have been a giant coil of hair or wire or something, I don't even know, but it, too. Hatke is an excellent anthropomorphosizererer, skillfully drawing the reader into caring about even the smallest and most unimposing of creatures/creations, with an immediacy that is impressive. You can't help but fall for our little unnamed adventurer and her newfound robot companion, and once you've decided to care about them, well, you may as well care about the pile of broken machinery in the junkyard, too, right? And that perky little fixer robot-bug-thingy, he's quite adorable now, isn't he? Hatke draws you into their magical little world so seemlessly that it seems obvious that you'd love these things. Of course you want to join our lonely little adventurer girl, let her lead you on explorations and discoveries, and bring smiles to each others faces. Lest you think Hatke's books are just cute, but inconsequential, they most certainly are not. The robots and their nameless human girl may draw you in with their sweetness, but there's depth there, too. There's a loneliness and sense of longing to the story that grounds it and makes it stick with you. I think at the core of all of Hatke's stories, there's a thread of "finding your people," even if those "people" aren't people. They're all about finding your place, your companion(s), your way in the world. Hatke's characters stumble upon each other by chance and it's as if a missing piece has been found; they fit together perfectly. It's charming and sweet and funny and real, and I think you can see why I end up singing his praises so often... And this time around, I was getting double-feels because it reminded me of another nearly-wordless, unlikely robot companion story, Robot Dreams , that is just one of the bestweirdestawesomest things I've ever read. So this is in excellent company. And of course, of course, the art is gorgeous. So what's not to like? Perfect blend of fun, humor, artistic beauty and action. As an adult I appreciate how Ben draws scenes I find quirky in the cuteness of the characters. These are great to read to children, especially because of the fun sounds we get to make from his words. Little Robot was a heartfelt tale of how a little girl can use her skills to help and make friends in the worst of scenarios. Releases Sept 1 from First Second Books. Review copy provided by publisher. Little Robot is yet another children's graphic novel that I picked up while working on the Bookmobile. Being surrounded by books, I have this longing to read everything I can. Not just because it'll make me better at my job when it comes to recommending books to kids, but just because I wanna read them all, dangit! Little Robot is nothing short of adorable. The story very much reminds me of The Iron Giant and Big Hero 6. It's pretty much the same story, so there's nothing particularly original he Little Robot is yet another children's graphic novel that I picked up while working on the Bookmobile. Being surrounded by books, I have this longing to read everything I can. Not just because it'll make me better at my job when it comes to recommending books to kids, but just because I wanna read them all, dangit! Little Robot is nothing short of adorable. The story very much reminds me of The Iron Giant and Big Hero 6. It's pretty much the same story, so there's nothing particularly original here. But that's not to say it isn't still a good read. It's very funny, but also has a tender and heartfelt message about friendship. 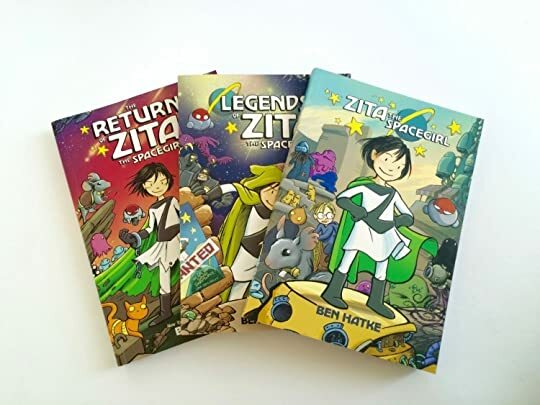 After Gabe and I finished the Zita the Spacegirl trilogy, we decided to check out all the Ben Hatke works from the library to see if everything he writes is as charming. So far, the answer is yes. Yes, he writes charming things. Here we have a lonely girl, one who doesn't seem well-loved by her family, who has no friends but who does have a big imagination and a giant sense of adventure. 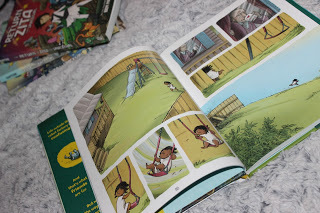 She's also awfully good at ti After Gabe and I finished the Zita the Spacegirl trilogy, we decided to check out all the Ben Hatke works from the library to see if everything he writes is as charming. Here we have a lonely girl, one who doesn't seem well-loved by her family, who has no friends but who does have a big imagination and a giant sense of adventure. She's also awfully good at tinkering. 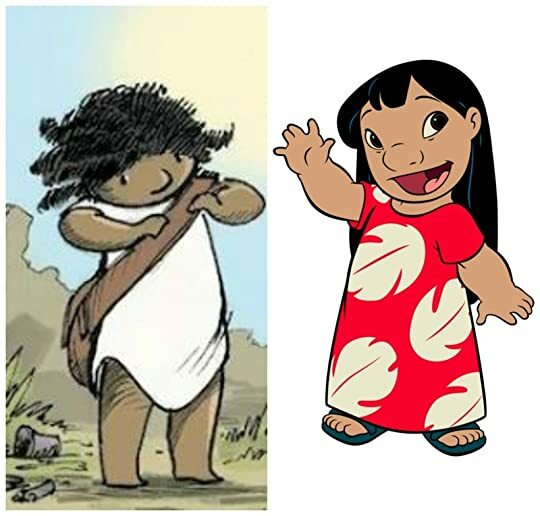 She's not unlike Lilo in both looks and lifestyle, only this little girl does own a magical white shift, one that resists dirt like a duck's back resists water. It's pretty impressive, though that was only my takeaway and not an actual element of the story. Like Lilo, this little tinkerer is left unattended during the day and creates her own entertainment. She likes to poke around the junkyard where, one day, she finds a messenger back full of tools. During her daily exploration, she finds a box floating downstream. She fishes it out and inside is a robot! Of course, she's able to assemble the robot and the two become best friends. But! The factory where the robots are activated notices there's a robot missing from the most recent shipment so it sends out a menacing-looking retrieval robot on a search and recover mission. Again, not dissimilar to Lilo and Stitch. This story is sweet and the art is delightful but the thing I liked best was the tinkerer's moral compass. She's awfully lonely at the beginning so when she finds a friend, her ability to think of her friend's needs is overshadowed by her own desire to keep her friend so she engages in some questionable actions using the excuse of keeping the robot safe. She comes to learn, of course, that she doesn't get to dictate the trajectory of her robotfriend's life, which is such a bittersweet lesson for so many of us bossy types, but her growth as a friend and as a person, in general, is beautifully illustrated. It's easy to understand for any reading level. Four stars: A beautifully illustrated story with minimal words that will appeal to all ages. One night, a large truck trundles over a bridge, on its way to deliver robots. An unexpected bump jars open the door and out plunges a box into the river. The next day, a precocious five year old girl, armed with her tool belt and wrench runs across the robot in the woods. When she presses its button, the robot comes alive. 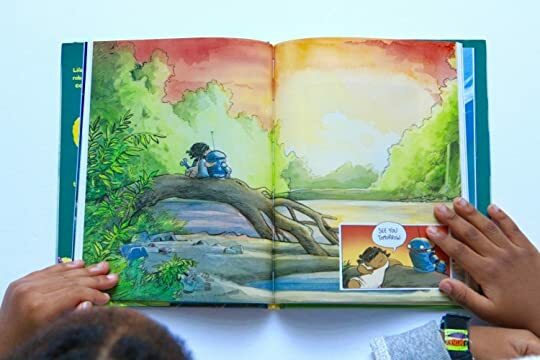 Though the two can't communicate with words, they quickly develop their own langu Four stars: A beautifully illustrated story with minimal words that will appeal to all ages. One night, a large truck trundles over a bridge, on its way to deliver robots. An unexpected bump jars open the door and out plunges a box into the river. The next day, a precocious five year old girl, armed with her tool belt and wrench runs across the robot in the woods. When she presses its button, the robot comes alive. Though the two can't communicate with words, they quickly develop their own language and become friends. Unfortunately for the new friends, danger is on the way. Once the factory discovers one of the robots is missing, a big bad robot is sent out to retrieve the little robot. Will the friendship be ruined when the robot is recaptured? *This was my first experience with a Ben Hatke book, and can say I was impressed. What sets this book apart are the gorgeous, detailed and colorful illustrations. The book has minimal words, and the dialogue that is present is simple and easy to understand. 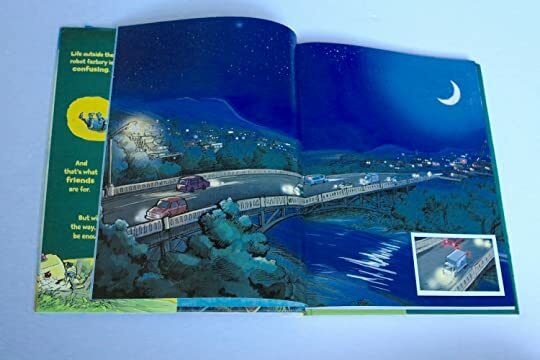 This is a book you can share with young readers because it is a read designed to use your imagination while making up dialogue based on the pictures. Both my four and six year old were enraptured with the book, and they both loved the pictures. *As an adult, I found there were times when I wanted more explanation, but that didn't bother my kids. They had no trouble latching on to the story and understanding what was going on. This is a terrific read for preschoolers and for those who are just starting to read. *The illustrations are not to be missed. They are full of color and detailed. It wasn't hard to make up your own words based on the picture. Definitely a very visual read, perfect for younger readers. *The book is all about making a new friend, who is different. I liked the message behind the story, and I liked watching the friendship evolve. A lovely, upbeat book. *The ending is sweet and cute, and it will make you smile. *There was a scene in the book when the girl and the robot run across a dead squirrel. I am not sure why the author included that in the book, it wasn't really relevant to the story, and I didn't like having to stop and discuss it with my kids. 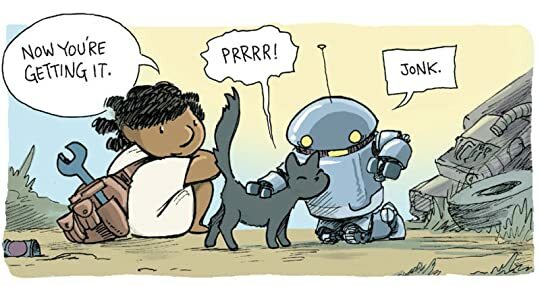 *This is a bit of a spoiler.... there is a scene where the big bad robot who is out to hunt down the missing little robot, appears to eat a cat. Don't worry this is done off scene, there aren't pictures of it or anything, just some sounds that imply the cat is eaten. I thought this might disturb my kids, so I glossed over it. Thankfully, at the end, the cat is okay. 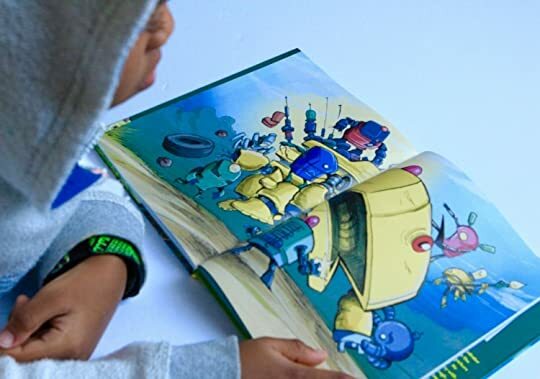 The Little Robot is a delightful read for beginning readers, or readers of any age who like colorful illustrations and using their imagination. This is a book with minimal dialogue, instead it is all about coming up with your own words based on the pictures. It is easy to follow and enjoyable for kids of all ages. A plot we have seen many times before: a robot who starts off innocent and relies on a human to gain new knowledge and insight on the world: The Iron Giant," "Short Circuit," or "Wall-E." A little girl discovers a lost, but curious robot and they explore and play together. But the robot wants to see more of his own kind and the girl tries to help until the mean recovery robot seizes her new friend. The artwork is designed for kids: cute and basic, but Hatke does a credible job capturing emotions A plot we have seen many times before: a robot who starts off innocent and relies on a human to gain new knowledge and insight on the world: The Iron Giant," "Short Circuit," or "Wall-E." A little girl discovers a lost, but curious robot and they explore and play together. But the robot wants to see more of his own kind and the girl tries to help until the mean recovery robot seizes her new friend. The artwork is designed for kids: cute and basic, but Hatke does a credible job capturing emotions for his human and mechanical characters. Read in two sittings with Evelyn (5) and Charlotte (3). They were both very into the story the whole time. It doesn't have a lot of words, but the pictures are very engaging. Highly recommend! Wow. I bought the ebook, but now I want a paper copy! The story was enchanting, working on several topics like friendship, loneliness or the need to be a part of something. I really (like really) enjoyed the interactions between the little girl and the tiny robot. It was great to follow them while the robot discovered the "world". The story was quite calm and light at the beginning but moved to something more serious later, a thing I enjoyed because it was realistic and moving at the same time. Wow. I bought the ebook, but now I want a paper copy! The story was enchanting, working on several topics like friendship, loneliness or the need to be a part of something. I really (like really) enjoyed the interactions between the little girl and the tiny robot. It was great to follow them while the robot discovered the "world". The story was quite calm and light at the beginning but moved to something more serious later, a thing I enjoyed because it was realistic and moving at the same time. Danger was added too, boosting the pace and my heart rate. It was very well told, with nothing out of place and plenty of feelings. And there were cats. And cute robots. This is a glorious piece of original fiction. The storytelling is absolutely brilliant. I could really see parents sitting down with their kids, flipping though all the bold imagery from the brave girl and the cute robot to the menacing machinery. Little Robot hits on so many levels ranging from friendship and bravery, to right and wrong. I mentioned the storytelling earlier and this is where the book really shines. The first few pages contain no words and I loved it. The imagery was so clear and This is a glorious piece of original fiction. The storytelling is absolutely brilliant. I could really see parents sitting down with their kids, flipping though all the bold imagery from the brave girl and the cute robot to the menacing machinery. Little Robot hits on so many levels ranging from friendship and bravery, to right and wrong. I mentioned the storytelling earlier and this is where the book really shines. The first few pages contain no words and I loved it. The imagery was so clear and provoking that no words were needed. I wish the entire book contained zero words, but eventually the characters begin to speak. This doesn’t hurt the book, but it would have been so much more bold and moving if no one ever spoke. There were no need for words. Which speaks to how universal the story and the message of Little Robot truly is. The main character of the book is a little girl who is both brave and intelligent. She solves her problems by being resourceful. The friendship that she finds with the robot is both touching and really teaches what true friendship should be. This is one book that should be part of any child’s library. As a GR friend (Hi Zaz!) raved about this book, I decided to order it for my daughter. It finally arrived, and we read it together today. 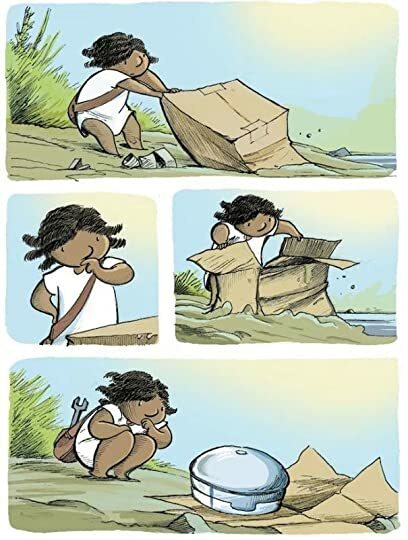 I'm not usually a fan of graphic novels, but this one works, and I think this style (mostly pictures & minimal words) really works well for kids that don't read (or that are learning to read). For my creative little lady, it's brilliant, as she can put her own words to it. The story is sweet, and the illustration style is lovely. My daughter is thrilled at As a GR friend (Hi Zaz!) raved about this book, I decided to order it for my daughter. It finally arrived, and we read it together today. 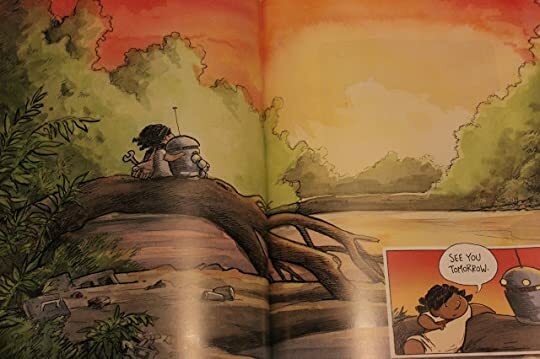 I'm not usually a fan of graphic novels, but this one works, and I think this style (mostly pictures & minimal words) really works well for kids that don't read (or that are learning to read). For my creative little lady, it's brilliant, as she can put her own words to it. The story is sweet, and the illustration style is lovely. My daughter is thrilled at the idea of being able to read this herself whenever she likes (without me having to read it to her), as this is the first "chapter book" that she can do that with. 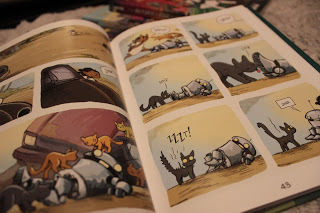 Little Robot is a really great graphic novel, particularly for younger kids wanting to get into the genre. It has such sparse text (and when there are words, it’s mostly robot noises), and yet, Ben Hatke’s storytelling is so damn effective. I haven’t come across a mostly wordless graphic novel that worked so well since Sara Varon’s brilliant Robot Dreams (..ooh, maybe robots are the key to cracking my code). It’s silly, heartwarming, and most importantly, a friendship story that’s a real winner. 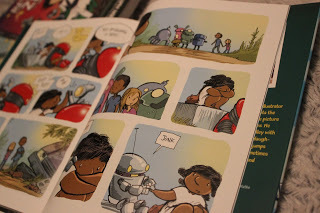 Little Robot is a really great graphic novel, particularly for younger kids wanting to get into the genre. It has such sparse text (and when there are words, it’s mostly robot noises), and yet, Ben Hatke’s storytelling is so damn effective. I haven’t come across a mostly wordless graphic novel that worked so well since Sara Varon’s brilliant Robot Dreams (..ooh, maybe robots are the key to cracking my code). It’s silly, heartwarming, and most importantly, a friendship story that’s a real winner. This is an amazing, almost wordless story, of a little girl who doesn't fit in, doesn't go to school, and doesn't appear to have any friends. This is also the story of a little robot, who is lost. And the two find each other. And did I mention that the little girl likes to fix things, with the tools in her tool belt? And did I mention that the little robot is being chased by something that wants it back? Quick, beautiful read. Great story. Children of all ages would enjoy it. This book is super cute! 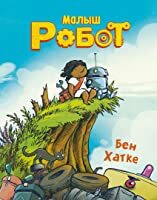 It's about friendship between an escaped robot from the robotics factory and a "fix-it Felix" little girl (who, like the robots, remains nameless). It's certainly charming. Also involves some cats, if that's your thing. I would recommend this for young children - words are few and far between so it's not a difficult read by any means. Disclaimer: I'm a huge Ben Hatke fan. It would be difficult for me not to enjoy one of his creations. This one is a friendship story with both mechanics and heart. Recommended for ages 6-8, all school library graphic novel collections and makes a great gift. There are many things to like about this book. Non-white female tinkerer protagonist, cats, robots, junk piles, lots of drama and emotion, and humor. Adorbs. Sweet and adorable 15 minute read. Really adorable, fun story. Minimal words, but maximum friendship. Delightful art paints a daring adventure. I can't wait to read it with my kiddo. Tak tohle bylo boží. Krásně dětské a roztomilé, infantilní, nádherné! This was cute, and pretty tolerable. I just don't love graphic novels. Even Maus was hard for me, so if I give a graphic novel a 3, it must be a pretty good one. Seriously, Hatke should be working for Pixar. I read this with m&o. They were enthralled. It took about two days, but they really got into the storytelling. I think it's the best of the graphic novels I've tried on them so far. And such a lovely story.